An attractive, very popular, evergreen native conifer, Common Yew (Taxus baccata) is a particularly long-lived tree (c.1000 years). Bearing attractive red berries in the winter it was previously quite commonly planted in churchyards, although the reason why remains unclear. It was also popular with Bowmen of the Middle Ages (not middle aged bowmen as that would be 40 year old Robin Hood "wannabes" going through their mid-life crisis in the nearest wood). The wood is like Superman doing Yoga in that it is strong and supple. Taxus Bacata will tolerate most soils and is one of the slower growing hedge tree species growing to be one of our longest lived trees. Expect a final height of 28m (93ft 4in) if untrimmed. 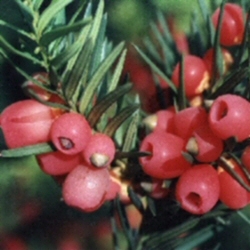 Taxus can react to colder weather and experience some browning of the foliage. During the colder times of year, you may get some Common Yew or Taxus Baccata plants that are a little brown. This is a reaction to the cold and is perfectly normal. As these are grown in trays and the inner plants are protected somewhat from the cold and do not turn brown so in essence, the brown trees are normal, it is actually the green foliage that is not performing as expected! Our yew hedging trees are sold as plug plants, in other words the roots are encased in compost. This means that planting can be carried out at any time of the year, provided they are watered in periods of drought, compared to bare-root plants which can only be planted during the plants normal dormant period (November to March). All of these trees are UK grown, which is important for successful establishment. How many yew hedging trees do I need? We recommend planting 4 plants per metre using the double staggered hedge method.